Rugby And Pints: Not Always About Rugby And Pints Genuinely Epic (If You Like That Kind Of Thing) Can He Flick It? Got Milk? Posted in Misc and tagged guinness, rugby at 11:32 am on February 1, 2019 by Aaron McAllorum. I don’t get the ad. Obviously it’s smart-bottomed but it’s flown right over my head. I guess it’s about being born supporting Ireland. But if they’re courting the Paddy Power style of controversy=popularity then the compaints should gush in from people who’s grandparents supported the Wallabies, died on the Titanic, were blind, hated sport etc etc. i think it means you don’t choose a team, because your family are irish, so no matter what team u like the look of, youre irish and that’s your team? i think. It seemed like that, but then i don’t know how its ur grandparents who chose to live in ireland. could go back further or sooner than that. its a bit convuluted i think. Is it trying to play on the whole Declan Rice / Soccer debacle? Nice move by Guinness to secure the 6 Nations as our sponsorship laws get tightened. Not so nice, really. 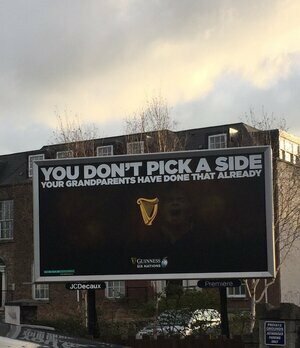 If your grandparents weren’t born in Ireland don’t support Ireland? I don’t get it either. Thought maybe it was some sort of Irish grandparent passport rule thing related to Brexit. I’m lost. “Thicker than Water” could make a good slogan for Guinness? I thought last year the hype train was going to get de-railed at the first game in Paris. Yeah and didn’t we beat the all blacks or something? We were woeful in the 2007 World Cup. Yes there was some media build-up and general hyped-up expectations but not in one’s face. Then in 2009 there was no hype at all and we won the 6Nations magnificantly and without fuss. Rugby, as opposed to soccer, does not do media hype-trains as much. 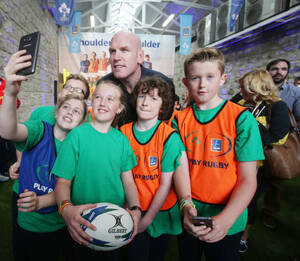 Dav is only happy when Leinster or France play. It’s a pathetic, racist reference to the Irish Civil War using the dead and injured to sell their product to cause more death and injury. Totally get it. Is it? Possibly, but more likely its just some halfwit marketing graduate thinking they are clever. Oh and I hate rugby to the extent I will be cheering on….who are they playing? England? Great, Come On The English! Up the Dubs! GAA rocks. Not that you will see this raised in higher education institutions o DCU marketing courses as a bad example. Or expect the OIrish Times to call this one out. Never the best at multitasking, and sucking at the Big G’s teat is more lucrative. More blacks, more Irish, more dogs. – lets see them try and rework that one.